Are you a fan of the Starz’ hit series Outlander? Of course you are! OutlanderStore.com is giving you the chance to win the Ultimate Outlander Fan Vacation Of A Lifetime during the Starz Outlander Store Experience Sweepstakes. Trip to Scotland for two including a tour of the historical setting of the worldwide hit series. In addition, 10 runner-ups will receive a prize pack of the Season 2 DVD, Season 2 Soundtrack, Jamie & Claire Funko set, and The Making of Outlander The Series book. 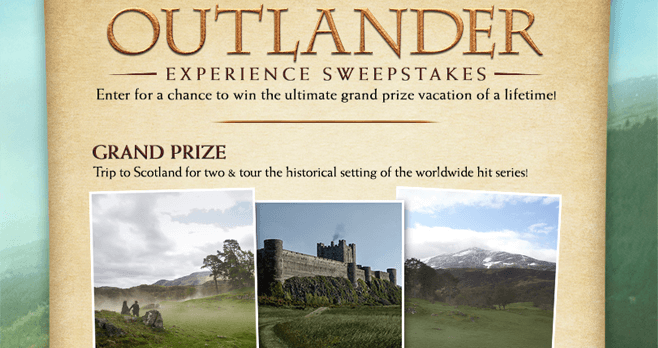 The Starz Outlander Store Experience Sweepstakes is open only to legal residents of the 50 United States and the District of Columbia, who are 21 years of age or older. The Sweepstakes runs from 12:00:01 am PT on October 18, 2016 until 11:59:59 pm PT on December 1, 2016. Regardless of method of entry, a participant is allowed to enter the Sweepstakes one time per week throughout the Sweepstakes Period. All winners will be selected in a random drawing from among all eligible entries received for the Sweepstakes, on or about December 8, 2016. The potential prize winners will be notified by email or telephone within 5 days of the random drawing. The Grand Prize consists of a trip for two to Cumbernauld, Scotland for the opportunity to visit a set location of Outlander. The trip package includes airfare for two, hotel accommodations for 5 nights, a visit to the set of Outlander, and select sightseeing opportunities. The approximate retail value of the Grand Prize is $6,000.00. The First Prize consists of a prize package containing one Outlander Season 2 DVD, one Outlander Season 2 Soundtrack CD, one Jamie & Claire Funko doll set, and a copy of the The Making of Outlander: The Series book. The approximate retail value of each First Prize is $127.95. The approximate retail value of all prizes to be awarded in the Sweepstakes is $7,279.75. In order to win the ultimate grand prize vacation, you will need to register for the Sweepstakes. To do so, visit OutlanderStore.com and look for the promotional banner. Click the banner to access the online entry form. Then, follow the instructions to complete and submit the registration form to be entered into the Sweepstakes for a chance to win. Alternatively, you may participate by mail. Simply hand print your personal information on a postcard and mail it to “OUTLANDER EXPERIENCE SWEEPSTAKES,” P.O. Box 6041, Sherman Oaks, CA 91413. For complete details, including Official Rules, visit www.outlanderstore.com/pages/outlander-experience-sweepstakes.